This research is the first to link a stone tool production technique known as 'platform preparation' to the biology of human hands. 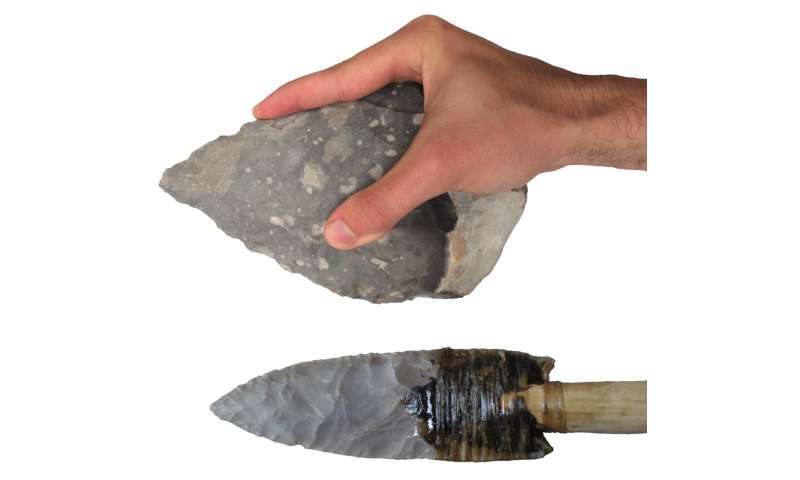 Demonstrating that without the ability to perform highly forceful precision grips, our ancestors would not have been able to produce advanced types of stone tool like spear points. The study, led by Dr. Alastair Key, of the University's School of Anthropology and Conservation, and funded by the British Academy, investigated how hands are used during the production of different types of early stone technology. The research demonstrates that the Boxgrove hominins (early humans) would have needed significantly stronger grips compared to earlier populations who did not perform this behaviour. It further suggests that highly modified and shaped stone tools, such as the handaxes discovered at Boxgrove and stone spear points found in later prehistory, may not have been possible to produce until humans evolved the ability to perform particularly forceful grips. This discovery is particularly important because human hand bones rarely survive in the fossil record. Dr. Key said: "Hand bones from before 300,000 years ago are rare, particularly when compared to other human fossils such as teeth, so the fact we can study the manipulative capabilities of our early ancestors from the stone tools they produced is incredibly exciting." The findings Manual restrictions on Palaeolithic technological behaviours Key, A. and Dunmore, C.J. 2018 are published open access in PeerJ 6: e5399.